There are about as many motivations behind commissioning custom wallpaper as there are images to help bring that motivation to visual fruition. 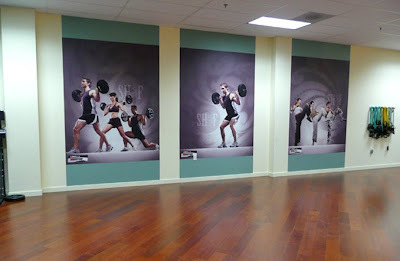 In the case above, wall murals of fit athletes engaged in physical activity are prominently placed in a work out area. The gym specifically is Shoreline Fitness in Clinton CT. We assisted them with this custom wallpaper project in late 2008. The impact of the imagery is clear, these wall murals will clearly help to motivate even the most novice gym member in achieving their goals. With an array of perfected physical specimens squarely in their face as they work out, gym members get an extra kick by seeing the possible end result of their labors. This is the real beauty of custom wallpaper: it has the capacity to truly affect the viewer due to it's grand scale. When thoughtfully laid out, the wallpaper not only conveys it's message, but also coordinates well and enhances additional decor within a space. The teals that are carried through the gym are represented in the wallpaper, keeping the gym's decor continuous as well as impacting. Images used for custom wallpaper can motivate you or your clients in infinite ways, start your custom wallpaper project with Great Wall Custom Coverings today!